FARM TO FREEZER: 12 Months & 10,000 Pounds! UPCOMING EVENTS: Lots of Co-op Month Events, Gatherings, etc. Hosted by actor Sam Waterston (Law & Order, The Newsroom), “In the Spirit of Cooperation” features stories from some of NCBA CLUSA‘s (National Cooperative Business Association / CLUSA International) members and development projects in the U.S., Mozambique and East Timor, including a credit union that helped revive a food desert, a coffee co-op that became its nation’s largest private healthcare provider, and a food co-op doing its part to combat income inequality by paying the highest entry-level wages in the country for its industry. Over six months and three continents, the Visionaries Series – which airs its 21st season on PBS in October – documents co-operative innovation at every turn, highlighting the scope, impact and potential of the co-op business model during NCBA CLUSA’s 100th Anniversary. Video Available for Screening in Your Community!Hosted by actor Sam Waterston (Law & Order, The Newsroom), “In the Spirit of Cooperation” features stories from some of NCBA CLUSA‘s (National Cooperative Business Association / CLUSA International) members and development projects in the U.S., Mozambique and East Timor, including a credit union that helped revive a food desert, a coffee co-op that became its nation’s largest private healthcare provider, and a food co-op doing its part to combat income inequality by paying the highest entry-level wages in the country for its industry. NCBA CLUSA is pleased to announce the release of a digital screening kit to enhance and promote local screenings of “In the Spirit of Cooperation” prior to its national broadcast. This is a great tool for community outreach, public events, and co-op member and staff education during Co-op Month and throughout the year. Available now on NCBA CLUSA’s 100th Anniversary website, the screening kitincludes a downloadable and customizable event poster, promotional postcard, social media graphics and fun facts to facilitate a Q&A session at your event. For a link to three versions of the documentary in HD, please fill out a screening application HERE. Be sure to share your screening on Twitter andFacebook by using #CoopDoc and #100YrsCoop and tagging @NCBACLUSA. For additional ideas and resources for your food co-op’s Co-op Month celebrations, please visit: www.nfca.coop/Co-opMonth. Co-operators in the USA are celebrating National Co-op Month in October with events across the country. This year’s theme is “Co-operatives Build,” with sub-themes such as Co-operatives Build Trust, Co-operatives Build Communities, Co-operatives Build Jobs and Co-operatives Build a Better World. “Co-operatives build in so many ways, so we encourage co-operatives to insert what they feel their co-op helps build as part of the broad theme,” said Jenny Bernhardt, chair of the Co-op Month Planning Committee. The month has been celebrated at national level since 1964, when it was launched by Secretary of Agriculture Orville Freeman. Regional celebrations were being held before then, however, with Minnesota the first state to declare an official Co-op Month proclamation in 1948. The government sponsored the Co-op Month until 1970. Since then, co-operatives and federations, along with the National Cooperative Business Association, have organised their own events to celebrate the country’s 29,000 co-operative businesses, which have 350 million members, generate $514 billion in revenue and pay more than $25 billion in wages. “The key thing is that your co-op plan some type of communications effort to help spread the word in October about why co-operatives are so important to your community, region and to the nation,” said Ms Bernhardt, director of communications for Cooperative Network, a regional association of co-operatives in Minnesota and Wisconsin. “National, regional and local polls consistently show that Americans really like the idea of doing business with a co-operative,” said Ms Bernhardt, “but so many people still don’t understand what co-ops are. The Neighboring Food Co-op Association (NFCA), which includes more than 35 food co-ops and start-up initiatives, is encouraging members to showcase their stories. For ideas and resources for your food co-op’s Co-op Month celebrations, visit: www.nfca.coop/Co-opMonth. 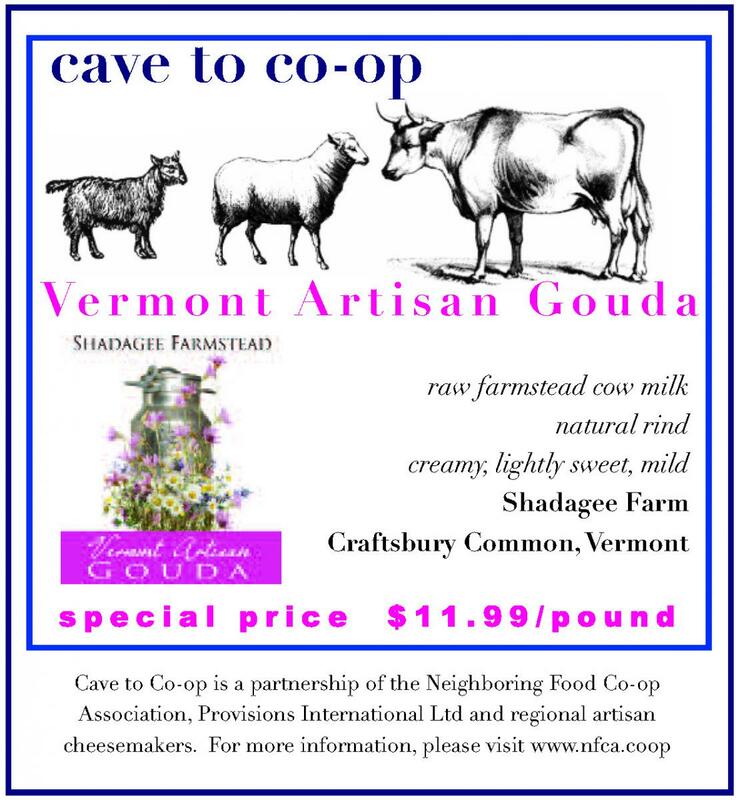 October’s “Cave to Co-op” special artisan cheese is “Vermont Artisan Gouda” from Shadagee Farm in Craftsbury Common, Vermont. Vermont Artisan Gouda is made from raw farmstead cow milk and the flavor is creamy, smooth and mild. Last October, the Neighboring Food Co-op Association (NFCA) relaunched “Farm to Freezer,” our own line of frozen fruits and vegetables, in collaboration with regional distributor Associated Buyers. Our goal was to use our shared purchasing power to work with family farmers to build a more sustainable and resilient regional food system. We are excited to report that over the past year, our member food co-ops have purchased over 10,000 pounds of Blueberries, Organic Broccoli, Organic Edamame, Organic Green Beans, and non-GMO Sweet Corn. And unlike other frozen products, these are grown and packaged right here in the Northeast, and sold in the freezer section of your local food co-op. As our harvest season comes to a close, you can continue to enjoy delicious, regional produce this winter and all year ’round! We invite you to look for our Northeast Grown frozen fruits and vegetables in the freezer section at your local NFCA member food co-op. They’re easy to find: they’re packed in a clear package so you can see what’s inside! For more information on our sourcing efforts, please visit: http://nfca.coop/regionalsourcing. As the harvest season in New England comes to a close, it is important to recognize that this has been a very challenging year for many of our region’s farmers. Late frosts damaged much of the peach crop and set back apple yields. Dairy farms have been devastated by the combination of an unprecedented drought over much of New England and exceptionally low milk prices. These issues affect our family farmers as well as the food co-ops and consumers who depend on them for fresh, local products. Agriculture is an inherently risky business. Recognizing that family farms are crucial to our economy and communities, government policy has traditionally worked to mitigate risks with so-called “safety net” programs. Unfortunately, many of our farms are now slipping through that safety net. The 2014 Farm Bill fundamentally altered these programs and the protections available to family farms. Previously based on ad hoc disaster assistance and direct payments, the new system is largely reliant on crop insurance. Thesupplemental disaster programs in the current Farm Bill provide very little direct assistance to producers. Adoption of crop insurance and other risk management tools remains relatively small in New England despite efforts made by USDA, the crop insurance industry, and the New England Farmers Union (NEFU). Perhaps these low adoption rates should come as no surprise. Insurance can be expensive, and many programs are complex and it can be difficult to decide which product to purchase and at what level of coverage. During the National Farmers Union (NFU) Legislative Fly-in in September, NEFU board member and Maine dairy farmer Mary Castonguay and NEFU’s new Policy Associate, Aaron Shier, advocated for reasonable solutions to the shortcomings of Farm Bill safety net programs. In the short-term, NEFU urged Congress to authorize emergency disaster payments to help dairy farmers and those impacted by drought. Longer-term solutions include an overhaul of dairy risk protection policy, especially a revision or reformulation of the Dairy Margin Protection Program (MPP). The delegation also highlighted research indicating that extreme weather events (such as the current drought) are becoming increasingly common in the Northeast. In turn, NEFU urged Congress to direct the Natural Resources Conservation Service to direct adequate conservation funding to help farmers better manage extreme weather events. For updates and resources for farmers that are dealing with drought, please visit NEFU’s new Drought Disaster webpage. In addition to these specific policy proposals, we need the Secretary of Agriculture to have the authority provided in previous Farm Bills to “provide assistance for economic losses in such manner as the Secretary deems appropriate” along with the means (that is, the money!) to do so. A major challenge we face is that these measures require the bold action of a Congress with little record of bipartisan performance. An additional difficulty is that we are seeking these changes during a “lame duck” session of Congress. In this context, the voice of our region’s consumers is critical. Food co-ops and their shoppers continue to be important supporters of our region’s producers, purchasing more than $50 million in local products annually. Members of our Congressional delegation also need to hear from you. We need to fix the broken Farm Bill safety net now before another family farm falls through. I also invite you to get directly involved by joining the New England Farmers Union at our Annual Meeting coming up on December 2-3 in Windsor, CT. We need to hear your thoughts and concerns as we bring our region’s producers and consumers together to begin the conversation about the next Farm Bill. Together, we are growing family farming in New England. The farm families who own Cabot Creamery are opening their gates to you on October 9, 2016 to show their appreciation for your support. Eachparticipating farm has planned different free activities, such as hayrides, scavenger hunts and games for kids from 11am-2pm. You’ll meet neighbors, farm critters and the farmers responsible for the World’s Best Cheddar. And the best part? Sampling Cabot’s awarding-winning cheeses! Join the Valley Co-operative Business Association and area co-ops for a screening of this new PBS documentary produced for the 100th Anniversary of the National Cooperative Business Association / CLUSA International and featuring local co-operative enterprises. For more information, e-mail info@vcba.coop.